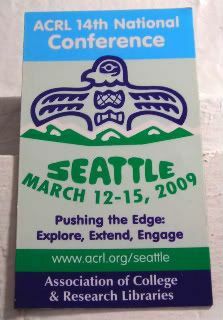 A librarian friend of mine brought this magnet back for me from a trade show/conference in CA, a couple of years ago. Funnily enough, it's one of the same friends who was down here in Orlando with us for SuperSoap Weekend a few years ago. Now I'm back in town for a 3-day long client event, and am not participating any down time or character seeing while we're here at the Disney Yacht Club & Resort. It's actually kind of funny how I'm now back here for work. Even funnier that in my head DisneyWorld has become more associated with ABC's soapstars than Disney's characters, but there you have it. I'm kind of sad, because I'm fairly sure that this client thing will host no panel with hot boys from any of my previous soaps. All day long, I've been catching myself giggling whenever I pass anything that has to do with that last trip - from the bathroom where I got stuck waiting beside Trevor St. John for his family, to the hotel where they housed all the VIPs, and even seeing the fun ferries around the boardwalk. Honestly, it's just so weird to be here and not see any people wearing soap star paraphernalia. Oh, well. Time to get ready for the big kickoff party...that I'm fairly sure won't involve a parade of convertibles with pretty people waving, and women of all ages screaming their lungs off and stepping on my toes. Literally. Though, I really need to speak to a weatherman about the weather. I haven't seen the sun once, and dang, it's freakin' cold down here. I'm really glad I didn't pack at all appropriately. Once again, it's because I missed Dave Price's weather. Sigh.